A Lovely View of Summer…. Today is the day of summer days seaside and yellow, blue and green only! I have got my hobby art stamps out as they are wonderful for a landscape and really easy to accomplish a watercolour picture without really trying. I have also got my watercolour paints out and mica paints and used my WOW Bright White embossing powder. I like to stamp in Memento London Fog as it gives it a less harsh outline to paint in. This is the only ink I have used apart from Versamark for the embossing powder. I firstly washed the watercolour card with different colours of green and blue for the land and sea, I then added clouds, waves and some birds. I stamped out the Penny Black brick wall (again- I Love this stamp) and painted with green blue and yellow, then cut it up. 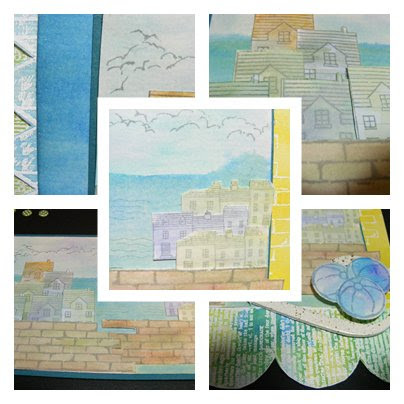 The houses I stamped out onto index cards from the local stationers and painted in. The boat and beach ball are hobby art. The background I stamps out with versamark and heat set with WOW Bright White embossing powder and painted over in the 3 main colours adding over the top distress ink in places in the same colours. The borders are Stampers Anonymous classic 6 again stamping in versamark, heat set with WOW white and painted with watercolour paints and mica paints which causes a resist technique and buffed. The flourishes are from Maya Road and heat set with Stampendous aged ivory embossing powder. The embellishment dots are Card Candy . ← What a load of old rubbish…. Hi Susan, This is so unique and artistic. Thanks for sharing with us at the CLP Sketch challenge.